Pen with Pull Out Menus Inside manufacture,exporter,wholesaler and supplier with stable quality, rapid delivery time and competitive prices to support your promotional business. Pen with Pull Out Menus Inside can be very useful to travellers, new visitors to shopping mall, buildings, hotels. And you can print your promotional CI on the face side, while the detailed useful map printed on the other side. Roll out flag pens manufacture,exporter,wholesaler and supplier with stable quality, rapid delivery time and competitive prices to support your promotional business. Roll out flag pens can be very useful to travellers, new visitors to shopping mall, buildings, hotels. And you can print your promotional CI on the face side, while the detailed useful map printed on the other side. Roll out scroll pens manufacture,exporter,wholesaler and supplier with stable quality, rapid delivery time and competitive prices to support your promotional business. 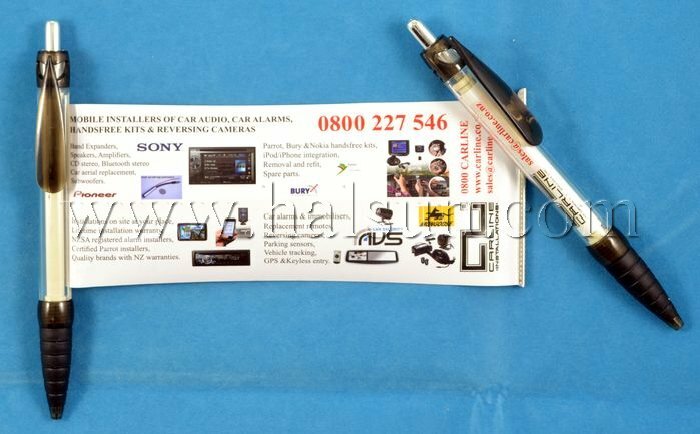 Roll out scroll pens can be very useful to travellers, new visitors to shopping mall, buildings, hotels. And you can print your promotional CI on the face side, while the detailed useful map printed on the other side. Roll out banner pens manufacturing company,Exporter,Wholesaler,Reliable supplier. Roll out banner pens manufacture,exporter,wholesaler and supplier with stable quality, rapid delivery time and competitive prices to support your promotional business. Roll out banner pens can be very useful to travellers, new visitors to shopping mall, buildings, hotels. And you can print your promotional CI on the face side, while the detailed useful map printed on the other side. Read more about Roll out banner pens manufacturing company,Exporter,Wholesaler,Reliable supplier.